Just Sold! 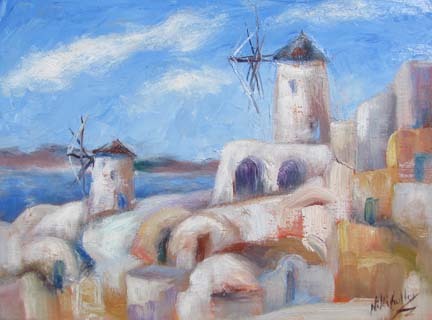 With so much beautiful scenery, it was hard to decide on a subject, but a couple of the painters chose this iconic view of the windmills and bleached architecture contrasted against the cobalt blue skies and waters below. Meanwhile the photographers climbed every nook and cranny in town in search for the perfect shot, and others chose to shop or relax with a snack, soaking in the gorgeous view over the caldera.